After several years of decreasing total (state and federal) dollars, the rate of decline for the Child Care Subsidy Program and Smart Start has slowed and funding for NC-PreK has increased over the past three years. State funding has not returned to its pre-recession levels. As state investment has decreased, North Carolina has increased its reliance on federal funding. The Child Care Subsidy Program is a two-generation approach that helps children from low-income working families attend high quality early education programs that build a strong foundation for all future learning and supports their parents’ ability to work and become economically self-sufficient. In addition, businesses rely on child care subsidies for their employees to have dependable child care, reducing employee absences and increasing employee productivity. Child care subsidy is funded through a combination of state and federal funding with the majority coming from federal funds. Federal funding comes from primarily two sources, the Child Care and Development Block Grant (CCDBG) and Temporary Assistance for Needy Families (TANF). In order to draw down federal dollars, the state must provide matching funds. Since 2007, state spending on child care subsidy has been on a downward trend. As the recession hit, North Carolina turned to federal funding made available to help states manage their struggling economies. By Fiscal Year 2008/09, the state was investing less than half of the state dollars it had in the previous year. Contingency funds from the Temporary Assistance for Needy Families made up most of the lost dollars. The fund was created by Congress for states to use during periods of economic distress. The state continued to receive an influx of federal dollars through 2011 for child care subsidy through the American Recovery and Reinvestment Act (ARRA) of 2009. As a result, while state funding went down, the impact was partially mitigated by an increase in federal funds. As the economy continues to recover, state funding for child care subsidy remains below what it was 15 years ago. At the same time, the number of children ages birth through eight living in low-income families (200 percent of the federal poverty level) has increased. In 2005, 498,000 (48%) of children birth through age eight lived in low-income families. By 2013, the number had increased to 585,000 (53%). *Smart Start funding for child care subsidy is not included. Smart Start is required to spend a portion of its funding on child care spending. That amount is included in the Smart Start appropriation. Smart Start is a network of 76 nonprofit local partnerships that serves as the state’s early learning infrastructure to improve the quality of child care programs and implement evidence-based programs to increase the health, well-being and development of children birth through age five in every North Carolina County. The program is mostly state funded, however local Smart Start partnerships are required by law to match 15 percent of those state funds with other resources. Research by Duke University found that access to Smart Start and NC Pre-K significantly reduced the likelihood that children will be placed in special education in the third grade, and increased third grade reading and math scores. 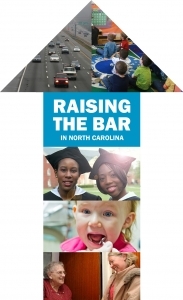 The North Carolina Partnership for Children, Inc. (NCPC) oversees the Smart Start network. It provides statewide governance, ensures programmatic and fiscal accountability, and provides guidance on evidence-based early childhood programs. NCPC allocates the funding appropriated by the General Assembly to the local partnerships. 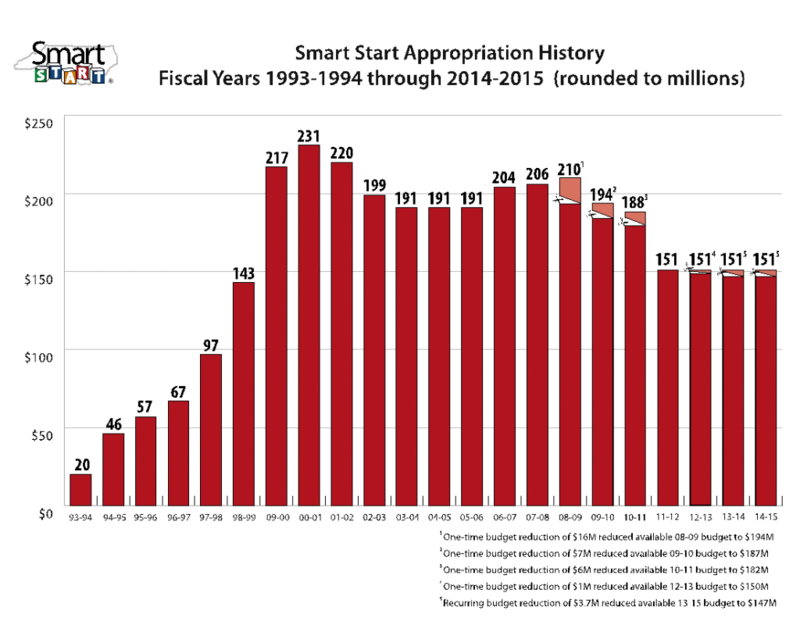 Smart Start public funding peaked in Fiscal Year 2000/01 at $231 million and has leveled out at $151 million since 2011. However, while the General Assembly provides a direct appropriation in the state budget for Smart Start, the North Carolina Department of Health and Human Services (DHHS) has been required to apply budget reductions across DHHS which has reduced the Smart Start allocation by $1 million in Fiscal Year 2012/13 and $3.7 million in Fiscal Years 2013/14 and 2014/15, bringing the funding for the program down to $147 million. Since 2001, North Carolina has provided full school day, public prekindergarten, now known as NC Pre-K, to more than 255,000 children. It is one of only five programs in the country to meet the National Institute for Early Education Research’s (NIEER) 10 quality benchmarks for preschool programs. At the local level, a NC Pre-K Advisory Committee oversees the program, including developing operational policies and procedures, providing programmatic and fiscal oversight, and ensuring collaboration and shared responsibility for developing, and implementing a plan to deliver services. The committee is represented by local school boards and systems, the local Smart Start partnership, licensed child care providers, Head Start, Departments of Social Services, parents of preschool-age children, county cooperative extension agencies, and child care resource and referral agencies. In the latest evaluation of NC Pre-K, researchers found that children are progressing at an even greater rate during their participation in NC Pre-K than expected for normal developmental growth. Earlier research showed that at the end of third grade children from low-income families who had attended pre-k had higher reading and math scores on the North Carolina end-of-grade (EOG) tests and fewer special education placements than similar children who had not attended the state’s program. Historically, NC Pre-K (formerly More at Four) has been paid for with both state general and lottery funds. 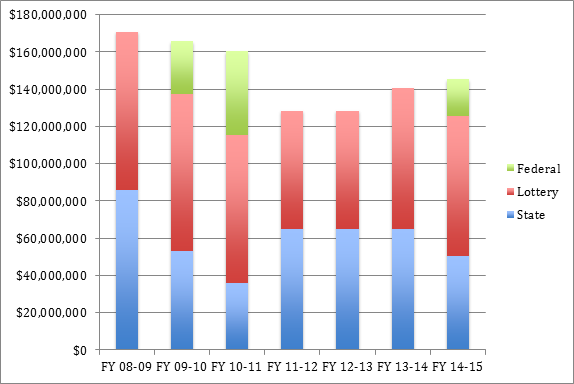 Total funding for NC Pre-K peaked in Fiscal Year 2008/09 at $170.6 million, comprised of almost an even amount from both sources. As with child care subsidy, the state began decreasing its general funds investment in favor of federal TANF funds when the recession hit. 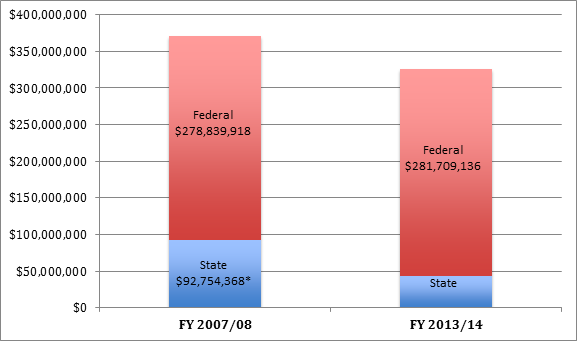 In Fiscal Year 2009-10 state general funds decreased from $86 million to $53 million. In SFY 11-12, a total of $9.1 million in state funding was spent for one-time expansion of NC Pre-K. In SFY 12-13, a total of $12.4 million in state funding was spent for one-time expansion of NC Pre-K. The North Carolina House and Senate Appropriations Committees on Health and Human Services oversee funding for child care subsidy, Smart Start and NC Pre-K. Funding for these programs is part of the budget appropriated to the Department of Health and Human Services. In Fiscal Year 2013/14, state funding for these three programs comprised 1.21% of the State’s General Fund Budget. While each program has its own direct appropriation, operationally early childhood programs combine state and federal funding so that programs work for families, to maximize efficiency and to serve as many children as possible. Note: Additional programs like early intervention, home visiting, child care resource and referral, Head Start and Early Head Start are vital components of ensuring that children have the optimal experiences to allow them to fulfill their potential. These programs either rely on federal dollars and/or comprise a significantly smaller portion of state dollars.